Crayons, cookies, toys. As toddlers we’re taught to share. It’s a tough concept but we learn it. But most of us could still learn to share generously. Imagine your most prized idea, the coveted concept that could move your organization, community or the world forward. Now give it away. A big part of playing well with others—and getting things done—is to share ideas freely! He who receives an idea from me, receives instruction himself without lessening mine; as he who lights his taper at mine, receives light without darkening me. That ideas should freely spread from one to another over the globe, for the moral and mutual instruction of man, and improvement of his condition, seems to have been peculiarly and benevolently designed by nature. 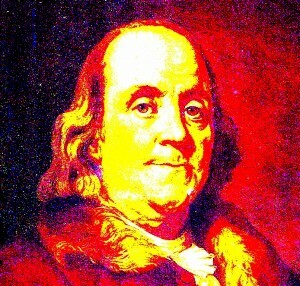 Jefferson’s friend Benjamin Franklin shared his ideas. How much have we gained because of his work on electricity and lightning rods, the public library? (And some of us benefit from his bifocal idea.) None patented. How much the world has benefitted because Franklin, Jefferson and others shared their ideas on democracy? As polio ravaged the world in the first half of the twentieth century, tens of thousands fell victim each year in the United States alone. In the fifties, fear of polio was the second only to fear the atom bomb. When Jonas Salk announced his successful polio vaccine he was considered a miracle worker; he was an instant hero. Remarkably, Salk refused to patent the vaccine and, according to a recent Forbes article, forfeited $7 billion. By sharing his life’s work, he made health more accessible to millions. Salk could see beyond the day, beyond the annual return. According to Salk, “Our greatest responsibility is to be good ancestors.” Share it forward. The notion of “sharing ideas liberally” defies the natural instinct to keep your ideas a secret. Yet, among the hundreds of successful creatives I’ve interviewed, a fearless approach to sharing ideas is one of the most common attributes. Why? Because having the idea is just a tiny step along the road to making that idea happen. During the journey, communal forces are instrumental in refining the very substance of the idea, holding us accountable for making it happen, building the network that will push us to go above and beyond, providing us with valuable material and emotional support, and spreading the word to attract resources and publicity. By sharing your idea, you take the first step in creating the community that will act as a catalyst to making it happen. When Rachel Carson shared in Silent Spring her ideas on the dangers of pesticides, others were able to rally to ban DDT. The spread of knowledge. The Encyclopedia Britannica was first published in Jefferson and Franklin’s day. A set cost a fortune, and EB recently quit its print operation. Why? To a large degree because crowd-sourced Wikipedia has more up-to-date information (equal to 1,900 volumes of EB) and is just as accurate. Sharing has transformed our access to knowledge. What was once only for the rich is now free to anyone with internet access. Likewise, WordPress and others have made creating a blog or website easy and more or less free, meaning almost anyone can participate in the sharing of ideas. In Momentum, Alison Fine says we need to move from proprietary to participatory. “Traditional activist organizations tend to work in silos and in isolation from their sister organizations,” she says. “These proprietary organizations keep information they consider vital to their survival, like strategic plans and membership lists, tightly sealed. They falsely believe that this information alone equals power.” Fine says the social sector has been slow to adopt the open-source approach found in programming code. Sharing with generosity is radical, beyond what we were taught in kindergarten. Knowledge is power, as we share ideas, we empower each other and empower the world. And get more done.